← PALAK CHICKEN( CHICKEN IN SPINACH) OIL FREE!! I just love it when i am sent a recipe with the pic and i cant wait to post it right away! A few days ago a dear friend of mine Sanjay Chadha from Madrid made some chilli chicken and was so kind to send me the pic of the dish.I jokingly asked him for a pic of him cooking and he sent that too! I put it on my facebook cooking page and his personal pic had more likes and comments! I was tickled and realised that yes a man in the kitchen is quite becoming for many women. 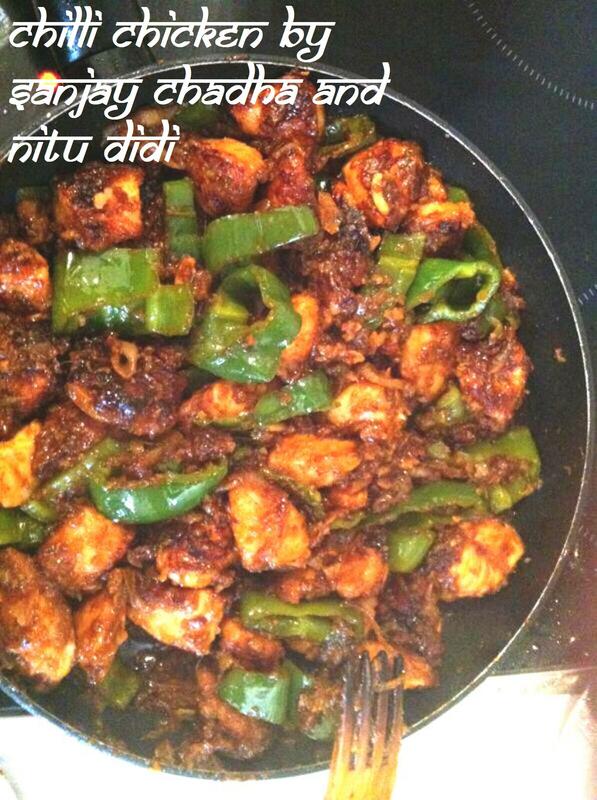 Anyways back to the recipe.. Chilli Chicken is a fusion dish and very popular in India. The ample use of ginger garlic and chilli sauce gives this recipe a unique taste. Some people make it by deep frying the chicken pieces ( i have put up a recipe in that style) and some arent so keen on deep frying. For the latter this recipe is just for you. Chopped green chillies can be added for a spicier effect. Marinate the chicken cubes in the ginger garlic, soya sauce and a bit of salt and pepper for an hour. Heat the oil in a frying pan till very hot and sautee the chicken pieces on high heat till well seared and done. Add the chilli sauce and ketchup and stir well. Check for seasoning and correct. Lastly add the cubed capsicum and toss for a few seconds. Serve hot. 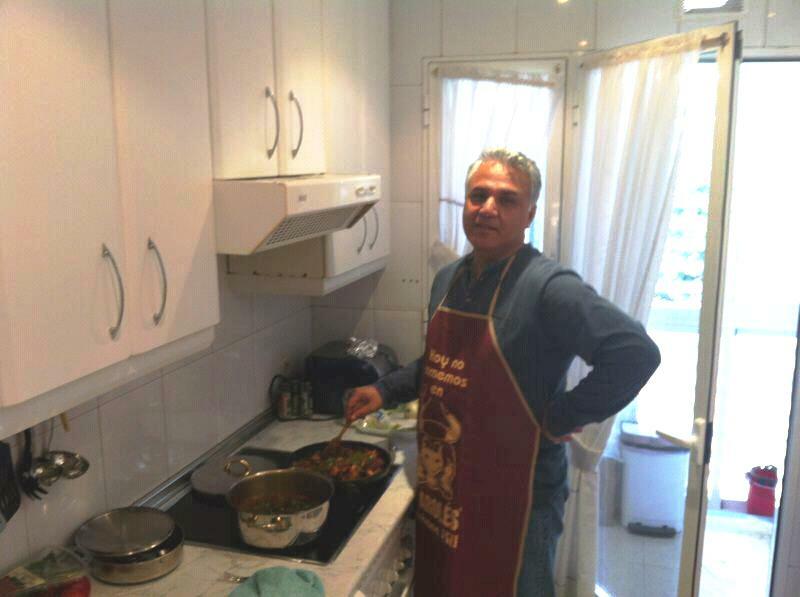 This is the pic that created a stir on my cooking page 🙂 Mr Chadha in his kitchen!! This entry was posted in Chicken, Fusion, Gluten Free, Made in China and tagged chilli chicken, chinese, fusion, indochinese, soya sauce. Bookmark the permalink. Sounds wonderful ! Thank you for sharing on my page! ❤ and hugs!